Gullies are common nuisances, causing road damage, sedimentation of streams, and other hazards to humans and livestock. People have tried to fix gullies by filling them up with slash, trash, straw bales, refrigerators, cars, or anything handy. This often makes a gully bigger and uglier. A gully is typically a symptom of another problem, such as a poorly placed culvert or other factor that has concentrated and increased water flow over the land. Gullies also form in response to stream downcutting. A headcut is typically found at the upstream end of a gully, although some cases several headcuts may be observed in a single gully. Each headcut, with the exception of the uppermost headcut, represents a former nickpoint and can continue to cause downcutting of the channel. Water pours over the headcut like a small waterfall, causing bank erosion and undercutting the base of the headcut, causing it to “migrate” upstream. 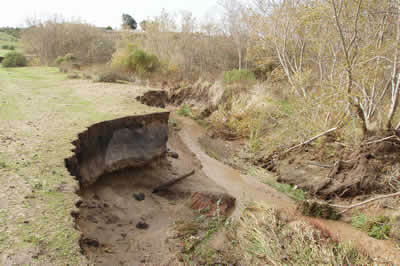 To slow or stop this migration and continued erosion, the headcut must be stabilized. In general a headcut must be regraded to a more stable angle and the soil covered by a variety of materials, from soil and concrete filled sandbags to rock riprap. If the area has year-round moisture, vegetation can be planted to further stabilize the banks. Because gullies and headcuts are typically symptoms of a larger problem, a repair project must include identification and treatment for the larger problem through an evaluation of the means of reducing flow at the site and stabilizing the ‘downstream’ channel/gully outlet. In order to arrest gully erosion at sites with relatively stable banks, the RCD of Monterey County experimented in the early 2000’s with two relatively low-cost grade stabilization structures: soil cement and brush packing techniques. At our project sites, we found these alternative structures served well to stabilize eroding gullies over several years of observation. Please note that such structures should be designed by a qualified engineer as these structures are very prone to failure if built incorrectly or applied in an inappropriate setting. Soil cement is a mixture of sandy soil excavated on site with portland cement. The mixture is compacted in place like earth fill and over time hardens to the consistency of sandstone. That gully site was stabilized for half the cost of using rock or concrete. Brush packing consists of placing layers of brush – willow or coyote brush – across the bed of the gully. After sediment is trapped to bury that layer of brush, a new layer can be placed on top to capture more sediment. The materials cost is very low, but the labor requirements are high. Headcuts should be repaired only after the cause of the gully has been identified and treated. The headcut can be caused by overland or subsurface flows. There must be enough space upstream of the headcut to pull back the bank to at least a 2:1 slope. Work should be done when the stream or drainage is dry. The structure must be designed for stability. The outlet must be designed and built to prevent damage to the structure, or downstream areas.